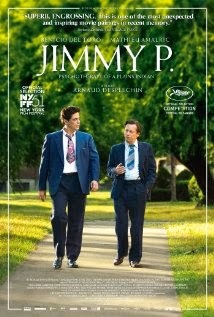 Movie Review: Based on a true story, the most recent drama from French director Arnaud Desplechin (“Kings & Queen”, “A Christmas Tale”), presents decent performances by Benicio Del Toro and Mathieu Almaric, who gave shape to a meritorious patient-doctor relationship throughout a complicated medical case with lots of psychology behind the scenes. Jimmy Picard (Del Toro) is a Native American rancher who, after return from WWII with a fractured skull, is struggling with sudden crisis, vivid dreams, and headaches that led him to lose partially his hearing. Sent to Kansas to be analyzed by a team of doctors who start to suspect of schizophrenia, Jimmy’s last hope will be French Dr. George Devereux (Almaric), a very humane person evincing profound knowledge of the Indian culture. Through psychotherapy and a non-judgmental behavior, Deveraux will reach those crucial moments in Jimmy’s life, making him revive childhood sexual traumas and guilt related to his ex-wife and a daughter whom he has never seen. Despite their occasional presence, women play an interesting role in “Jimmy P.”. Not only Jimmy deals with a repressed anger in the presence of women, but also Deveraux has his own psychoanalysis, trying to understand the relationship with his lover Madelaine, the wife of an admired colleague. Psychology lovers should see this film, while the ones who are looking for more energy and thrill may find it too slow.